Treatment of an aromatic molecule such as benzene with sulfur trioxide and strong acid leads to the formation of sulfonic acid in the reaction of electrophilic aromatic substitution. Concentrated sulfuric acid does not sulfonate benzene at room temperature. However, when benzene is treated with fuming sulfuric acid, a sulfonylation reaction occurs and benzene-sulfonic acid is obtained. Fuming sulfuric acid is a mixture of sulfuric acid, H2SO4 and sulfur trioxide, SO3which is very powerful electrophile. Aromatic sulfonylation is a reverse process and if benzene-sulfonic acid is heated with dilute aqueous sulfuric acid, the starting benzene is obtained. In the first step, the benzene functions as a nucleophile forming an intermediate which is deprotonated in the next step, restoring aromaticity. 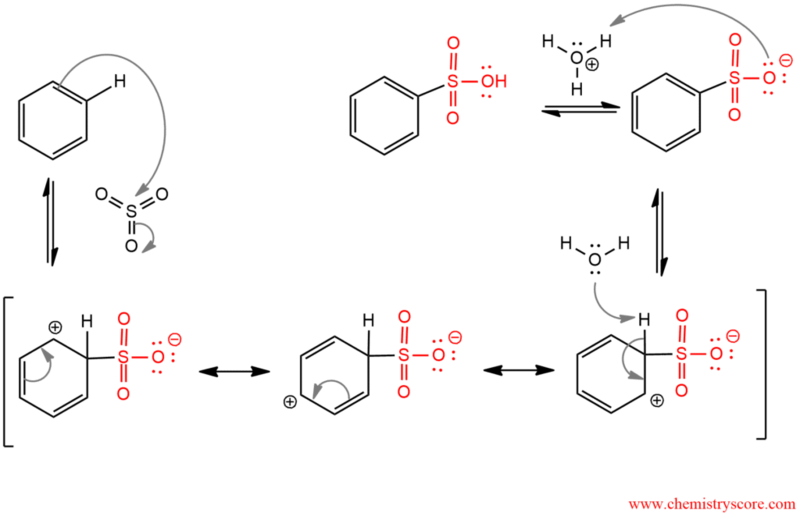 And the last step is protonation of the sulfonic group and obtaining the final product.